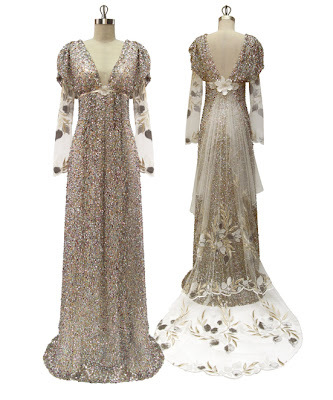 The first two things that come to mind when I consider Claire Pettibone dresses are: ethereal beauty and whimsy. Her clear aesthetic and painstaking attention to detail combine to create some of the most unique bridal couture I've seen in awhile. 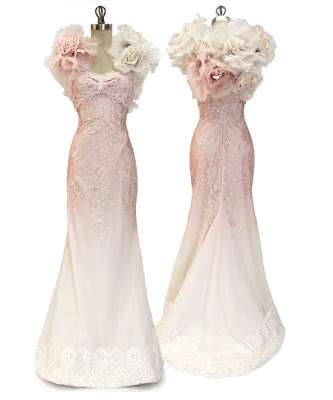 While I tend to be drawn to lines that I feel cater to a wide range of bridal personalities, I think the Claire Pettibone bride is more specific. I love that. 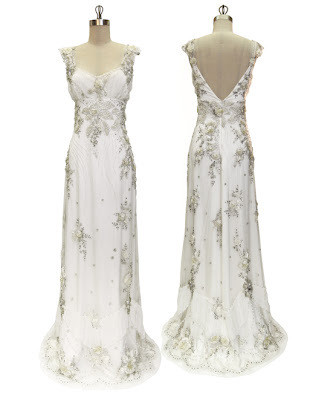 From the website: For the woman who dreams of pure poetry in motion, Los Angeles designer Claire Pettibone will indulge her every romantic inclination. Born to artist parents, it was inevitable that Claire would enter a creative field. She spent her early childhood living in rural New York in a nineteenth century home where her parents created their art, and Claire began to draw and paint as well. At the age of 4, she attended a wedding at St. Patrick's Cathedral in Manhattan that left a lasting impression. Claire was so enthralled with that walk down the aisle, that she began drawing brides and begged her mother to make her a wedding gown! The Cherry Blossom. Yummy. 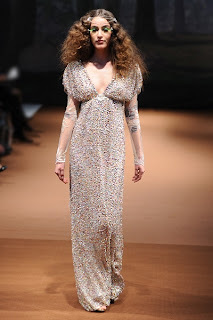 I appreciate the simple train to contrast with the spectacular detail on the rest of the dress. Sparkly gossamer embroidery, crystals...le sigh. Ah, the Kristene. I love this dress, I really do. The layering, the luscious lace and the heart shaped train. Ah, yes. The heart-shaped train. Just cutesy enough to really nail it. I like that. The Dew Drop. One word. LOVE. I LOVE this. Pale pink ombre, a sweetly bubbly skirt and one of the best boleros I've ever seen. As many of you know, I am a HUGE fan of differently-colored wedding dresses and for me this one is a '10'. The Crescent. Sweetheart necklines, tulle, crystals and beads. These are few of my favorite things. It's on a model and it's so good I can't stand it! Simply marvy!! From the blog: In 1997, Michael moved to Dubai. His first job was very challenging…he was about to change the image of a slightly staid big fashion house. ” I was so scared and don’t know what to do but eventually had the courage to reinvent the image of the house and I think the Dubai fashionistas eventually saw the catcher of an edgy, new young designer.” Michael says. Soon the fashionable woman of Dubai has been choking on their Carpaccio as he began to inject a new vigour into couture. This might be the crown jewel of his 2010 Madame Butterfly collection. The detail and raging, rambunctious color is just stunning. It's so good, I might pass out right here. Go to the website. Read the blog. Be inspired. Pinterest: My New Favorite Obsession! So, there is this thing that exists that might be one of the coolest things in the history of ever. 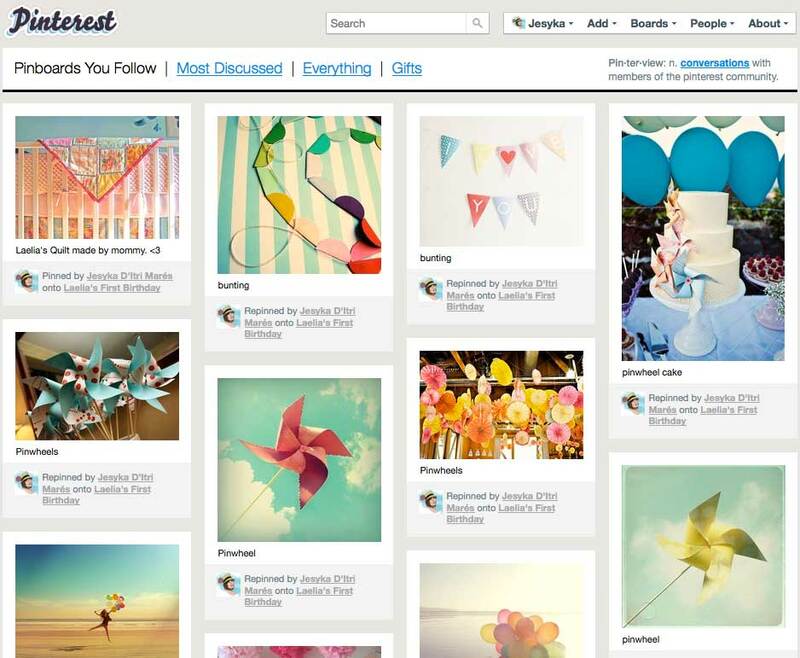 It's called Pinterest and it's awesome! T-shirts, DJ equipment. You name it, people are pinning it. So let's take a moment to explore what this means for Goldiluxe and for you. I now have an almost instantaneous way of connecting with my clients and friends (now, if I could figure out how to do it on my iPad). 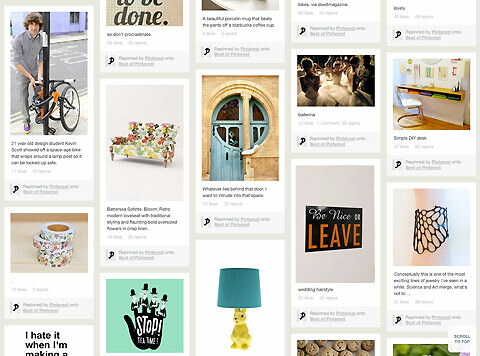 We can build inspiration boards, gift guides and design boards. Together. You, my lovely readers can drop by my little corner and see what inspires me. What moves me. I can share all the things I love with you. Theoretically I could pin (isn't that cute, pin) some of the best images from Goldiblog all in one place for you. Sounds great, right? Well sadly it's invite only right now, but if you contact me, I can send you an invite and get you in on the action. You can check out what I'm doing, here. I'd love to see you on the boards. Welcome to the second installment of Technoluxe! On Friday, I will be reviewing an app that I bought on a whim. 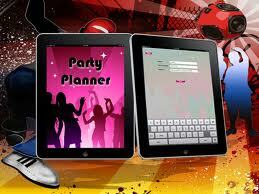 It's called Party Planner HD and it comes to us from a company called iTech Developers. It seems kind of cute, so I'm excited to dig in and tell you all about it on Friday! Yay! A baby! My very good friend is having a baby girl and she has bestowed Goldiluxe with the honor of designing her shower. And the theme? Woodland Creatures! How totally, wonderfully cute, right? This marks the first Goldiluxe baby shower. Again, yay! 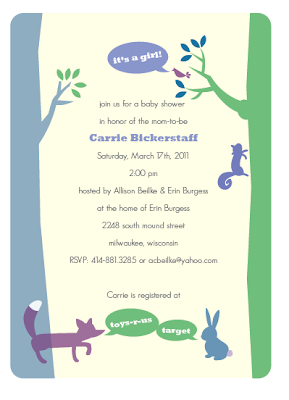 Luckily, I'll be teaming up with the totally brill (and soon to be Auntie) Allison C. Beilke so I'm sure we'll have a hit on our hands. To get myself in the mood, I thought I might share a little of what's inspiring me! How about we start with the invites! So cute, don't you think?! I love, love LOVE them. These little darlings will be hitting mailboxes soon and I couldn't be happier! More on the party later! 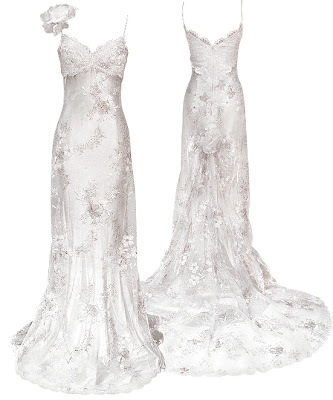 So, I realize I might be a little tardy to the party, but have I got the bridal line for you! This year, my beloved Anthropologie has finally released a bridal line! It's called BHLDN and it's frickin' ah-MAZING! They've done it all. Shoes, jewelry, gowns, hair accessories, lingerie....you name it. I love it all. Seriously. All. Of. It. As heartbreakingly difficult as it was , I've managed to pull together three of my favorite pieces from the line. Enjoy! This is the Tulle Era dress. Totally gorge. 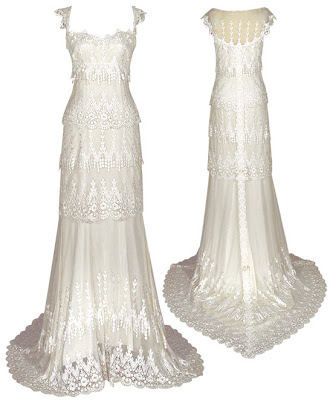 This might be the loveliest tea length wedding dress in the history of ever. This Tracy Reese original has worked its way into my heart. This is literally killing me, its so beautiful. Mercy! These Something Bleu satin slingbacks are just unbelievable. I also love that this totally yummy saffron is a hue exclusive to BHLDN. Silk upper, leather sole, handmade in Italy. What more could you want. These little beauties are also available in ivory and blush. Swoon! I really love seeing all the super fab alternatives to traditional veils. This one is no exception. 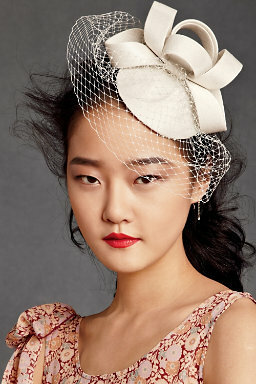 A modern twist on the birdcage veil, this silk coil hat by Nicole & Co. is just the thing for the retro loving bride. There you have it! My three favorite pieces. 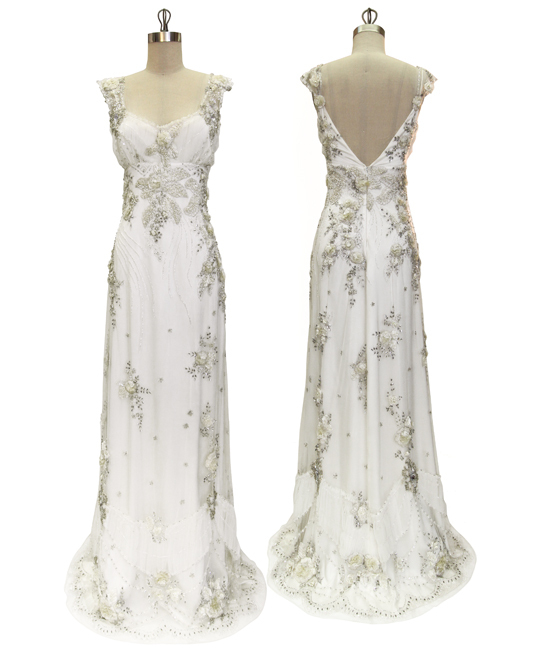 For the full Monty check out the BHLDN website!